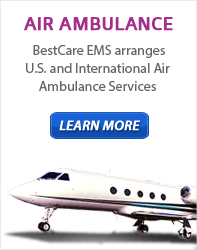 BestCare EMS arranges & coordinates U.S. and International Air Ambulance Services. We assist patients, family members and case managers with Air Ambulance Transportation to worldwide destinations. An Air Ambulance flight crew consists of a Certified Flight Registered Nurse (CFRN), Certified Flight Paramedic (FP-C), a certified pilot and a Medical Doctor when required. Medical crews and pressurized aircraft are able to assist patients in any condition. All of the aircraft are required to meet all fixed-wing and rotary wing FAA requirements and are maintained by a licensed maintenance staff. To Schedule an Air Ambulance, Visit BestCare Air Ambulance.